After some initial wariness I’ve finally started to come round to the Harry Potter movies. They’re not as clever as everyone says and, more importantly, they’re not quite as clever as they think they are. I have a good friend whose wife is a big fan of the Potter books. He’s been reading twenty-volume science-fiction novels for the better part of his life and every time it’s implied that J.K. Rowling invented this technique with Harry Potter you can see a dull irritation cloud his eyes. But the Potter movies have an endearing and light-hearted spirit of whimsy from which a certain other, recent fantasy trilogy—more overwrought, overlong, and overrated—could have greatly benefited. 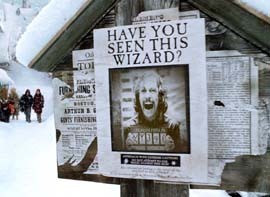 I’m sure plenty of parents felt compelled to cover the ears of their children when it was announced that Chris Columbus, who directed the first two Potter films (The Sorcerer’s Stone and The Chamber of Secrets), would be replaced by Mexican director Alfonse Cuaron for Prisoner of Azkaban. Columbus is known for family favorites like Home Alone, while Cuaron came to fame two years ago with the R—or was it NC17?—rated Y Tu Mama Tambien, you know, the one where the guy and the girl and the other guy go on the road trip, and then there’s a bit too much hoochie-coochie. But, really, he’s the right man for the job, for two reasons. First: wasn’t Y Tu Mama about two teenage guys and a woman discovering themselves? Harry (Daniel Radcliffe) and his two best friends Hermione and Ron (Emma Watson and Rupert Grint) are about 13 now. Not only are the boys starting to really notice the girl for the first time, but all three of them are becoming wary of traditional ideas of authority. Cuaron reaches past all the magic and special effects and shows three teens gradually becoming disillusioned by the establishment and realizing that their elders were once as young and as stupid as they are. And maybe their elders are still just as dumb. To this end, the students at Hogwarts are portrayed with untucked shirts, rolled up sleeves, and loosened neckties, and Harry seems to be suffering from a perpetual bad hair day. He’s grumpy and given to bursts of anger, while Ron and Hermione bicker about their pets an awful lot. The scene where the boys take turns with magic tablets, just for laughs, is framed and acted as if they’re passing around a doobie, and when we first join Harry, he’s hiding under the sheets in his bed, playing with his magic wand. The boyish adventure of the first two films has happily collided with movies like Thirteen and I Capture the Castle. "Introduces ethnic minorities to Hogwarts, creating the impression that we are in modern England instead of 1935 . . ."
The second reason Cuaron is the right director is, well, he’s just a better director than Chris Columbus. Those familiar with Y Tu Mama will remember how long many of his individual takes are; dialogue scenes are unbroken by cuts, allowing them to build up momentum and rhythm. The Prisoner of Azkaban follows this same pattern, and we feel more of Harry and the kids are being revealed when we don’t cut away to something else, or when the foreground doesn’t have to be cluttered with effects. Cuaron also has some athletic fun flying through mirrors and out windows, but this trickery tends to only bookend dialogue scenes, and is not an end in itself. But onto the summary: a parallel world exists to our own, run by wizards, witches, and magicians. The training ground for their kind is the school of Hogwarts, and the brightest, and also most troubled student at the school is Harry. An orphan whose parents were killed by an evil wizard, he is perpetually trying to unravel the mystery of their murder, and navigating among professors who know more than they are telling, and who may even be duplicitous. In this episode, the latest piece of the puzzle comes when a murdering maniac (the great Gary Oldman, whose basic mood is anger) escapes from a supposedly-impenetrable magic prison. Ghastly, flying prison guards known as Dementers surround Hogwarts to await his inevitable arrival. Haunted houses, secret passages, werewolves, time travel, griffins, shape-shifting rodentia, and British actors spitting out threats, accusations, and plot points with perfect Shakespearean enunciation ensue. There’s a routine to the Potter films, in which the long, long first act is spent on build-up, on guns put on mantles but never fired, and on members of the enormous British supporting cast alluding to things from Harry’s past which are too horrible to speak of openly. There are some tedious bits in which Harry’s aunt, uncle, and school enemies hate him feverishly without much motivation, and, in much the same that movie cops are always one step away from losing their badges or “riding a desk,” Harry is always a hair’s breadth away from expulsion. As in the previous films, characters introduced as trustworthy end up hiding something, and the initial villain is a red herring. Columbus, in his reverence of the books, plays all this straight, while Cuaron realizes the Encyclopedia Brown/Nancy Drew silliness of it all and introduces a little gentle mocking and exaggeration. There are several instances of “I bet that made more sense in the book,” and if someone like Terry Gilliam or Tim Burton was at the helm, the exaggeration level would be so high that the absence of sense would turn into its own kind of sense. That would be cool. Cuaron also introduces ethnic minorities to Hogwarts, creating the impression that we are in modern England, full of blacks, Indians, and Pakistanis, instead of 1935. This will no doubt allow the series, which has always availed itself of Britain’s finest actors, to eventually include the two sisters from Bend It Like Beckham as upperclassmen who say “bugger” a lot while smoking cigarettes behind the castle. 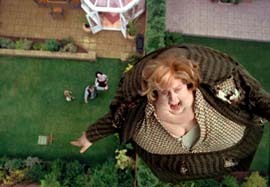 Prisoner of Azkaban’s latest additions include a bug-eyed and scenery-munching performance by Emma Thompson (Sense and Sensibility) as a daffy teacher of divination. Her ex-husband Kenneth Branagh was a charlatan in the previous film; I guess being a big phony is always alluring for classically trained thespians. In my limited exposure to the outside world, I have detected none of the criticisms that the previous films and books accrued from certain Christian groups claiming that children shouldn’t be watching and reading about black magic. Magic in the Potter universe is treated like a tool, to be learned and mastered like any other skill, not involving prayer or meditation. Why Potter’s non-religious magic would come under fire while The Force, which does actually ring of religion, goes unnoticed, is beyond me. Wiccans, i.e. genuine practitioners of witchcraft, who can easily explain the origin of the flying broomstick misconception, have much more right to be offended. But because Harry Potter is intended for mass, worldwide consumption, no one in it has a particular religion. It should be noted that Harry’s friend Ron is picked on by English kids, has red hair, and comes from a big, generous family of innumerable siblings. If that isn’t movie code for an Irish Catholic, I don’t know what is. But I digress. This is a fun, beautifully made film, with a great supporting cast and the same wonderful production values as its two predecessors. The result is characters we care about in exciting, intriguing situations, filled with color and brilliance. As children, we may not have been betrayed as badly as Harry and his friends sometimes are, but we remember the sting of parents turning out to be fallible and adults siding with the rules instead of with us, and we remember giving up those illusions. We may not believe in magic or in griffins, but the capital-T Truth Cuaron has brought to the series is sound. What more do you want from a summer movie?